Need a store on your Facebook page? Product information from Payvment’s Facebook page. If you find you are driving interactions with your customers and fans via Facebook, why not add a store to your Facebook page? Didn’t think it was possible? Well, applications, or “Apps” as they are affectionately know as, are a real revolution in the functionality of software these days. From social medias like Facebook, to accounting software like Xero, you can get an App for just about anything to enhance or quasi-customise your software purchase. One such App is Payvment. Currently offering a free online store to Facebook users, its a god send to businesses that have developed a heavy Facebook following. 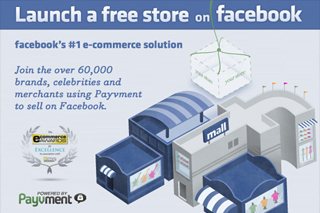 Many business face the customer experience problem of moving customers from social media to webpages or external shops or payment providers, but Payvment is an example of a great way to enhance your Facebook experience and secure a secure a sale or lead in the process. Check out Payvment.com on the web, via Facebook or Twitter. This entry was posted in Facebook, Innovation, Optimize e-Marketing, Optimize Facebook, Optimize Sales & Marketing, Optimize Start-ups, Social Media, Support for your Business and tagged brand, customer service, e-commerce, e-marketing, e-shop, facebook, Facebook Store, new customers, online store, small business, SMB, SME, social media by Andrew McIntosh CPA, Optimize Business. Bookmark the permalink.